In engine preheating mode, the engine coolant is heated slowly using a heating element while the vehicle is stationary. 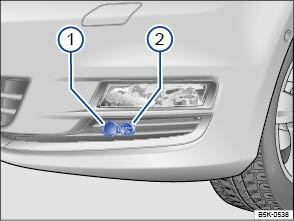 To do so, the cables supplied with the vehicle must be connected to a 230-volt socket or a 115-volt socket, e.g. in a garage. The engine will reach its operating temperature much more quickly if the vehicle is switched on when the coolant has been preheated. This reduces fuel consumption and exhaust emissions during the warm-up phase. Preheating the engine can take up to 3 hours depending on the outside temperature . Only use the cables supplied with the vehicle. All cables and connections must be undamaged . Insert the connecting cable into the socket . Connect the connecting cable to the mains cable. Connect the mains cable to a 230-volt socket or 115-volt socket that is earthed and equipped with a residual current circuit breaker. Before starting the engine, always remove the connecting cable and close the cover . Incorrect use of the engine preheating system can cause short circuits, electric shocks, fire, or severe and fatal injuries. Connect the mains cable to a 230-volt socket or 115-volt socket that is earthed and equipped with a residual current circuit breaker, and protected against water, moisture and other liquids. Never connect the engine pre-heating system to any other socket, irrespective of whether it is protected or not. The use of unsuitable or damaged sockets and mains cables, and failure to adhere to general safety procedures, can lead to short circuits, accidents, severe injuries and death. Never use damaged sockets or mains cables. Check connectors and cables for damage before use. Never modify or repair electrical components. Always protect electrical connectors from water, moisture and other liquids. It is sufficient to test the residual current circuit breaker once a month if the engine preheating system is only used occasionally. If it is used regularly, have it checked once a week.